Australia has 35,000 kilometers of coastline and 80% of the population lives within 100 kilometers of the shore. The largest island nation in the world has a fabulous ring road called the Great Ocean Road and it is literally filled with seaside villages, quaint little fishing towns, some of the best surf spots in the world, coastal wineries that have a very long growing season due to the tempered climate. The photo opportunities along the Great Ocean Road are a photographers dream come true. Snap shots of surfers at the world famous Bells Beach, home of the Rip Curl Pro. Get some sand between your toes, and then enjoy brunch while supporting a great cause in the seaside town of AngleSea. Start the morning right watching surfers at Bells Beach. The annual Rip Curl Pro is held at Bells Beach every April. 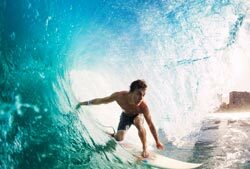 It typically happens toward the end of April, however as with all surfing events dates can be moved depending on the mood of our Mother Nature. Bells Beach is known world wide as a fantastic surf spot. If you are feeling particularly adventurous you can rent a board, or if you have one let your operator know and we will make sure that it fits in the minibus we send for your private tour. The eastern view of the Memorial Arch is a fabulous photo opportunity. The Great Ocean Road was built by World War I Veterans to commemorate their more than 3000 fallen comrades. This is usually a very moving experience. Take a moment to capture the moment. Once you have your photos it’s time for a walk on the beach. Feel the sand between your toes and get your appetite worked up for our brunch stop in AngleSea. Walk along the water feeling the waves kiss your toes as the cool water contrasts with the warmth of the golden sand. Let the ocean soothe your soul. The next stop along your tour of the Great Ocean Road in Sydney is brunch at the Deck Cafe & Bar. The Deck is located at the Anglesea Surf Life Saving Club (SLSC) which was established in 1952 and overlooks the famous Anglesea Main Beach. We highly recommend the Veneziano coffee which is roasted in Melbourne and is absolutely to die for. A bonus for photographers, take a little time to wander around the Deck and admire all the vintage seaside photographs on the walls. Get inspired, before you go shoot a koala. After enjoying your meal at AngleSea time to walk it off and try to shoot a Koala, with your camera that is! The Kennett River is a coastal town with a lovely river and surrounding bushland that is home to many wild animals. The small population and the general quiet are an ideal environment. Koalas are nocturnal so catching a glimpse of one during the daytime is difficult but not impossible. Have your camera on standby for the opportunity. If you donât happen to catch a Koala Bear, there are plenty tropical and subtropical birds in the enormous trees. Parrots, lorikeets, and kookaburras are just some of the species found in this magnificent rainforest. Koonara is the name of the property that yields the grapes that produce the Koonara brand wines. Their 2010 Pinot Grigio won the Gold Medal and there are a range of wines available for tasting. This is perfect opportunity to pick up some wine and cheese for the walking sites that are in store on the rest of the tour. Spend a little time shopping for homewares, and selecting the wine to get you through the rest of the journey. Mait’s Rest is the next destination where you will get a guided bushwalk through the cool rainforest. Get up close and personal to the towering trees. Get your camera out for some unique shots of the treetops from the ground. This is a great place to experiment. Some of the trees in Otway’s Rainforest are among the tallest in the world. Learn all about the ship that could not bear to leave her mother land of Australia. Get a shot of Australia’s most famous shipwreck The Loch Ard. More photos are available at Dumpling Pots, The Razorback, and View the Archway. This magnificent natural bridge stood for thousands of years. Read the harrowing account of the day London Bridge collapsed told by the last person to cross it. Feel the hair stand up on the back of your neck as you look at the spectacle knowing what happened the day it fell. The collapse occurred at approximately 3:30 in the afternoon on the 15th of January 1990. Winter tour bonus – Take photos of the Little Penguins that use this area for mating in the winter. They come out at dusk. After your full day of adventure exploring all the greatest sites of the Great Ocean Road you can sit back and relax on your private minibus as your driver takes you and your group back to Sydney. Enjoy conversation about all the great things you saw while touring the Great Ocean Road. Sip your wine, and toast your friends. From limestone cliffs, to fallen bridges, to great rain forest elders, to surfers, see many of the things that makes Australia an amazing place to live and visit all in one day. 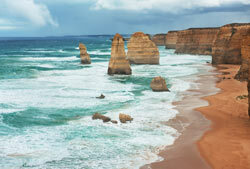 To book the Great Ocean Road Tour call 1 800 BUS CHARTER, or use our online enquiry form now.